Saadiyah is using Smore newsletters to spread the word online. This week for homework students had to come up with questions related to their topic that they wanted to investigate further. These questions were then shared and discussed during our Thursday exhibition session to help groups come up with possible Lines of Inquiry. 1) Come up with 5 essential agreements for your group. This will be shared with your group at a later date. 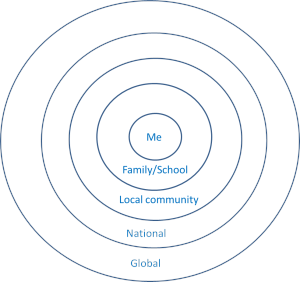 2) Arrange your big ideas for your topic on a diagram of concentric circles (Diagram below). Does it relate to me personally? To my family? Or is it a local, national or global issue? This week we started our new unit on 'How We Express Ourselves'. The central idea for this unit is 'The performing arts can be used to express our ideas and entertain'. Please refer to the unit letter sent home that will include more information about this topic. A big part of this unit is the Grade 5 performance, Cinderella. Each student has their role in the performance and will be spending the next few weeks preparing for this. This week Grade 5 did an assessment on fractions, decimals and percentages. Students will get a chance to review this assessment and reflect on it. It is encouraged that students continue revising this topic. This can be done using IXL. Over the coming weeks students will be working on rotational symmetry, lines, angles, probability and reviewing time (i.e. understanding schedules and timetables).